(LAS VEGAS — June 30, 2015) — The International Parking Institute (IPI) named the Pittsburgh Parking Authority as the 2015 Parking Organization of the Year, citing its incorporation of technology to improve efficiency, customer service, and sustainability as models for others in the industry. The annual award, announced at the 2015 IPI Conference & Expo in Las Vegas today, recognizes public or private parking organizations, departments, consultants, suppliers, and commercial operators that exceed expectations and meet exceptional industry standards. Nominations are accepted on an annual basis and judged by IPI’s Professional Recognition Program Committee. The Pittsburgh Parking Authority has distinguished itself as the 2015 Parking Organization of the Year for its distinctive organizational concept. Charged with addressing citywide parking needs and supporting economic development and quality-of-life initiatives, the agency is not only financially self-sufficient but also funds other city services and activities. This independent status enables it to consider current and anticipated parking industry advancements, evaluate them on a cost-versus-benefit basis, and implement those offering the greatest rewards as funding permits. The Authority recently replaced Pittsburgh’s outdated coin-operated, single-space meters with multi-space, card-payment metering and became the first city in the U.S. to fully commit to pay-by-license-plate technology. Further advances include remote purchasing of additional parking time, drive-by enforcement employing plate-reading cameras, electric-vehicle (EV) charging stations, and the installation of LED lighting in a downtown garage. The city also introduced dynamic pricing based on fluctuations in customer demand in several locations, and city-wide coverage of pay-by-phone usage will be adopted by the end of the year. Receipts from on- and off-street spaces and card-based payments have risen dramatically, despite rising meter rates and annual increases in garage parking costs. Customer usage of metered spaces is increasingly in compliance with posted restrictions and public attitudes toward parking services are improving. The Authority projects it will pay the city $25 million in 2015 ̶ some $7 million more than the amount transferred the previous year. 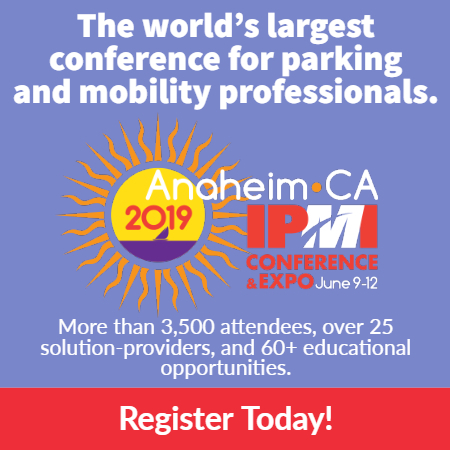 For more information about IPI, the largest association of parking professionals and the parking industry, visit parking.org.